Description: NASA's two-seat F-16XL research aircraft is shown in the modification hangar at the Dryden Flight Research Center, Edwards, California, during installation of a titanium "glove" on the upper surface of its modified left wing. 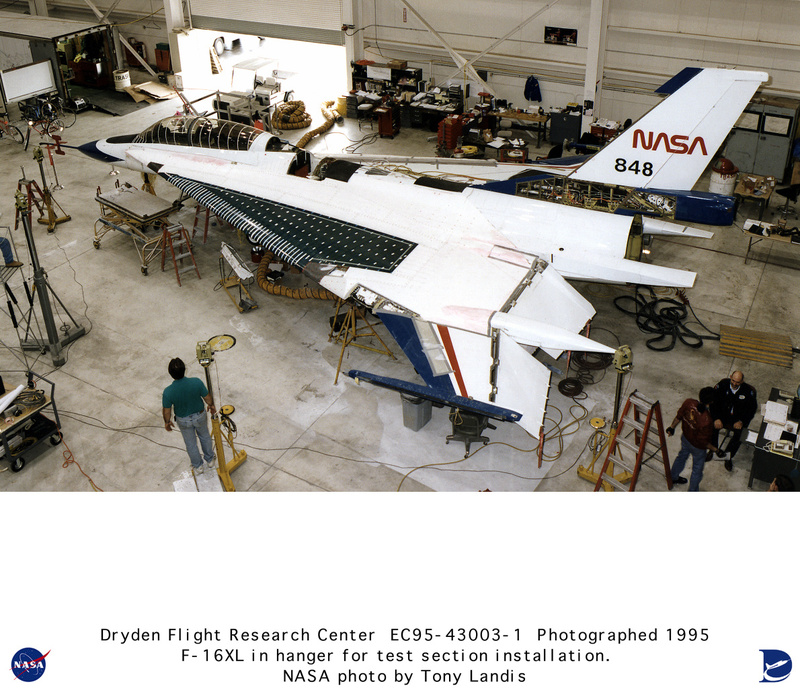 The aircraft subsequently concluded a 13 month-long, 45-flight research program which investigated drawing off a small portion of the boundary-layer air in order to provide laminar -- or smooth -- flow over a major portion of a wing flying at supersonic speeds. A turbo-compressor in the aircraft's fuselage provided suction to draw air through more than 10 million tiny laser-drilled holes in the glove via a manifold system employing 20 valves. Data obtained during the program could assist designers of future high-speed aircraft in developing a more efficient civil transport.